Spacious, comfortable and in a very convenient location by the train station . It’s like a home from home . The host Joseph is very helpful and even let me leave my car at the property the day after my stay whilst I travelled by train to the football at Fulham and back . The apartment was very spacious and the owner, Joe was prompt at responding when I got lost! 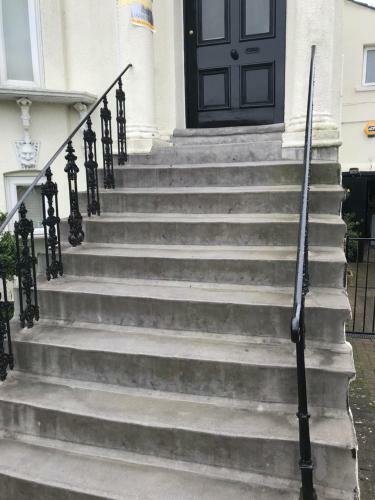 He directed me, met me outside, offered me a parking space, as well as accommodating my froend’s Motorcycle safely round the side of his house. He was also very informative on bars/eateries and directions to them in the local area. Second time we have stayed and it is just a fantastic apartment. Bonus marks this time for allowing us to check in 3 hours before the usual time. Excellent facilities in a large flat and good value for money. We thoroughly enjoyed staying at the Staines Apartment. The location was excellent, directly opposite Staines mainline station, which was very handy for catching the train into London. This one-bedroom apartment was large and homely: it occupies all of the first floor of the house. The rooms have high ceilings (due to its Victorian architecture) which made it feel particularly specaious. And it has been decorated in such a way that it felt like we were staying in a friend's home. And Joseph (who lives in the basement flat with his family) was a terrific host: he was easy to contact ahead of our arrival, and then gave us a thorough tour of the apartment (and the appliances such as the heating system, the washing machine and the dryer) when we arrived. We certainly recommend this apartment to other travellers, and would happily stay there again when visiting London. Fantastic apartment in a very convenient location. Right by the station but with no noise from it. Very spacious and comfortable. Well equipped kitchen. We booked for another stay before we left. Absolutely everything! Was so homely and Joseph was so helpful throughout. Lock in a great price for Staines Apartment - rated 9.7 by recent guests. Offering free WiFi and garden views, Staines Apartment is an accommodation located in Staines. The apartment features city views and is 23 miles from London. With 1 bedroom and 1 bathroom, this apartment features a flat-screen TV and Blu-ray player. There is a dining area and a kitchen complete with a dishwasher, an oven and a microwave. Windsor is 6.8 miles from the apartment, while Reading is 30.4 miles from the property. London Heathrow Airport is 6.8 miles away. 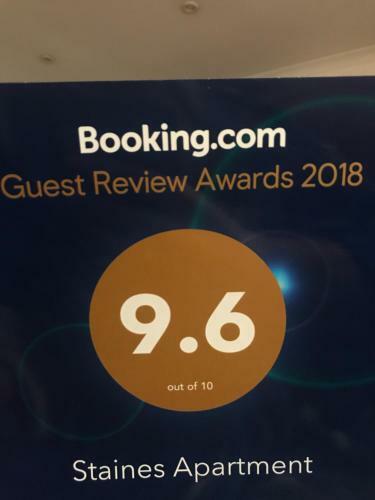 Staines Apartment has been welcoming Booking.com guests since 11 May 2017. When would you like to stay at Staines Apartment? This apartment has a electric kettle, fireplace and oven. very large and spacious victorian town house spartment, 10 feet high ceilings , living room , bedroom , and kitchen. centrally located 1 minute from Staines Railway Station. 15 mins from London Heathrow. 10 mins from town centre. House rules Staines Apartment takes special requests - add in the next step! All further children or adults are charged GBP 10 per night for extra beds. It was a wee bit chilly in the morning but I guess I could have found the heating if we weren’t checking out, ad I also realise that the space (which was lovely) was a factor. There was loads of cereal, a welcome accompaniment when waking up hungry but no milk except for jiggers! Those are great for tea and coffee but a small pint of milk might have been a nice touch. Though it really wasn’t a massive deal as there are shops nearby. I could have stayed another night. It was a bit noisy late evening as the Station is directly over the road with lots of coming and going but on the converse side would be perfect if you were travelling by train. My husband likes a totally dark bedroom, just as a personal preference. Mimi blinds worked for me. The apartmrnt was large and cozy. I felt right at home immediately. So convient to the train and taxi. Shopping was within walking distants. Loved the relaxing town after a day in busy London. I would recommend this apartment to anyone. This place has a lot of character! Nothing! As a light sleeper, I thought it might be a problem that we were so close to the station. There was a faint sound of trains at night, but that is all it was - and it certainly wasn't a disturbance. A wonderful apartment full of character and a fantastic location. It was close to many facilities and also Heathrow Airport. Our host was very helpful and welcoming. The trains bothered my partner but I didn’t mind them. Also a little annoying that the WiFi didn’t reach my side of the bed. Much more spacious than expected, great value for money. Very friendly host. Loved watching the squirrels in the garden. Pictures on the walls were interesting to look at too. Great that it had parking right outside and was very easy to find. Also great to see the bathroom stocked up in case we forgot anything.